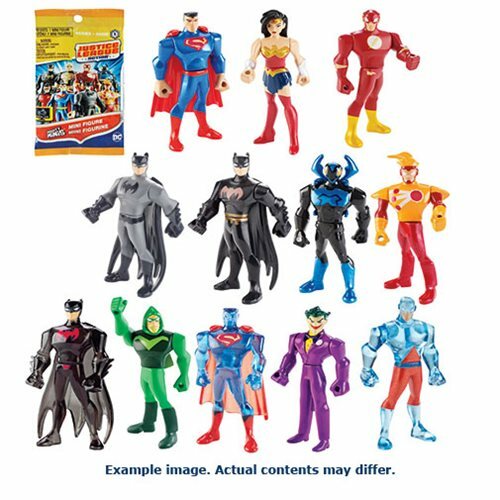 Collect all of your favorite heroes and villains with this Justice League Action Mighty Minis Series 1 Mystery Box Case! Your favorite characters from the animated series come alive in their iconic suits and feature pop off joints to create your ideal DC character. Choose from Batman, Superman, Wonder Woman, and more! Each bag is a surprise, so collect them all to create endless heroes and villains. Measures about 2-inches tall. Ages 4 and up. This Justice League Action Mighty Minis Series 1 Mystery Box Case contains 36 individually packaged blind bags.